Dino Hunt made the 1998 Games 100 list as one of the best games of the year! Dino Hunt received the Parent's Choice Silver Honor. Travel to prehistoric times to hunt dinosaurs . . . and bring 'em back alive! 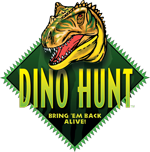 Dino Hunt is a family game for two or more players, age 8 and up. In Dino Hunt, you travel through time, visiting the different eras where the dinosaurs lived, to capture them for your modern-day zoo. But the other players have cards that can make your hunt harder – and watch out for that charging T. Rex! Simple to learn and easy to play, Dino Hunt carries the Dinosaur Society Seal of Approval – all dinosaur information and art in the game conforms to current scientific knowledge. Dino Hunt features over a hundred different dinosaurs. Each oversized card has full-color art from some of the best dinosaur artists in the world. The back of each card gives the most up-to-the-minute scientific data the experts can provide. The basic Dino Hunt package includes 150 cards, full-color rules and other components – and four plastic dinosaurs for playing pieces! – for $19.95. "Booster packs" of Dino Hunt cards include all the cards from the boxed set, and 121 new ones! The booster cards are gold-bordered and dated 1996, to distinguish them from the cards in the basic game. And each 5-card booster pack is only 99 cents! These gold-bordered cards will not be reprinted – this is a true limited edition. Dinosaur fans, and devotees of non-sports art cards, will want complete sets. And every POP contains at least one gold foil "fossil" Ultra-Rare card. 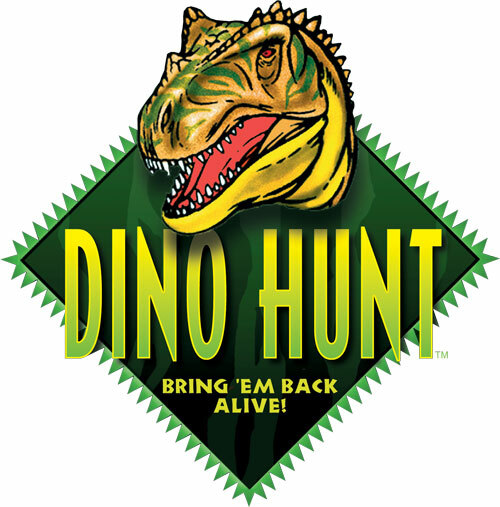 Ask for Dino Hunt at your favorite game store! Roll the dinosaur picture, and you caught him! If you get the leaf picture, the dino is hiding, and you can try again. If you get a footprint . . . you're STOMPED! Dino Hunt is a dice game for 3 to 8 players. Each game takes 10 to 20 minutes, and can be taught in a single round. Bring 'em back alive! In Dino Hunt, you travel through time, visiting the different eras where the dinosaurs thrived, and try to capture them for your modern-day zoo. But the other players have cards that can make your hunt harder – and watch out for that charging T. Rex! The boxed set has 109 full-color cards, featuring illustrations from renowned dinosaur artists and the latest, most accurate data dino experts could provide. Dino Hunt is simple to learn and easy to play, good for beer-and-pretzels gaming and perfect for that dinosaur-loving youngster you know. The Dino Hunt Boxed Set has everything you need to play, but you can expand your game with the Dino Hunt Limited Edition Booster Packs! 150 cards in 30 boosters, 4 Energy Tracks and dinosaurs, 1 6-sided die, 1 bag of glass stones, and 1 Time Track. We originally published this as a two-player demonstration set for Dino Hunt promotion, but we sneakily made the dinosaurs and Energy Tracks purple and orange . . . so when you combine this with the red/blue/green/yellow dinos in the Dino Hunt box, you turn it into a six-player game. 30 cards, 4 energy markers, 2 assorted plastic dinosaurs, 2 Energy Tracks, 1 Time Track, 1 spiffy poster, and rules. Expand your Dino Hunt game with these limited edition booster packs! Each pack contains five gold-bordered, limited-edition cards. Some of the cards are gold-bordered versions of the cards from the boxed set, but the rest are new cards not available anywhere else – 240 cards in all! And ten of the cards are ultra-rares, featuring gold-foil-embossed pictures of real dinosaur fossils. This set is a must-have for any dinosaur fan or card collector. A whole box of Dino Hunt Limited Edition Booster Packs – 40 packs in all, plus a bonus . . . one loose gold-foil fossil card! And, on the box, there's an extra bonus: rules for playing "Dino War"! 5 cards per booster, 40 boosters per POP.